Scrubbing of Corrosive Gasses like Clz, Brz, lz, Soz, Co.
lntermediate duty of 8 to 10 hours per day running. Occupies less space, easy to handle & economical. Electroplating solution circulation & etching solution for electronic circuit board. Available with PVDF impeller & silicon carbide mech. seals for high temperature ancj aggressive acids. Pumps are available with lnternal Mechanical Seals (lMS). 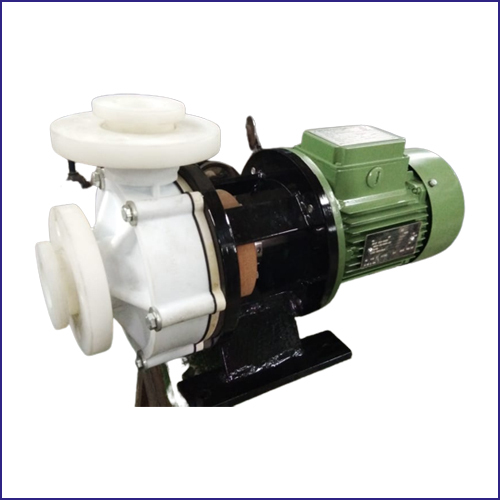 Above pumps are also available in PTFF lined construction. Pumps are supplied with special Mech.Seals for applications like Slurries, thicker liquids, rnixing fluids etc.